NOTE: All events except the wedding and reception are subject to change until the week before the wedding! 8:30 p.m.: Come hang out with us in the dining room of the Holiday Inn Express Poughkeepsie! [Note the change!] We are beyond excited to spend as much time with you over the next few days as possible! Around 10:30 or 11 p.m.: Join us for an ill-advised, carbohydrate-laden meal at Acropolis Diner, affectionately referred to as "The Acrop." It was a late-night tradition for Ted and his friends. 8:00 a.m.: Join Erin and Ted for a dawn stroll on the Walkway over the Hudson (from which the picture on our Save the Date card was taken.) It's a metaphor! We'll park and meet at the Parker Avenue parking lot (61 Parker Avenue) at 8:00 and begin the walk around 8:05. 11:30 a.m.: Noah, Ashley, and other Vassar friends attending our wedding will lead the most entertaining campus tour you will ever take! Meet in front of Main Building! Jackets and questions are highly encouraged. 4:00 p.m.: Ceremony in the Vassar Chapel! Children are welcome to attend. Immediately afterwards: A lovely evening stroll over to Vassar Alumnae House. Then: cider, cocktails, dinner, merriment, and shenanigans in the Alumnae House! Due to limited space in the Alumnae House dining room, we'll arrange childcare. Please let us know if you'd like to use this. From 9:30 a.m. until the last person leaves: It's over! Or just beginning! We'll gather for breakfast, caffeine, and conversation at the Holiday Inn Express! Erin and Ted are told that exhaustion stimulates creativity, so we'll have lovely, endlessly creative conversations for as long as you can stay! There are six airports convenient to Poughkeepsie: JFK, LaGuardia, Newark (sorry), Newburgh, Albany, and Hartford-Springfield. Amtrak and Metro-North provide rail service to Poughkeepsie. Metro-North is the ticket (badum-cha) for people coming from New York City: it's an exquisite hour-and-a-half-long trip up the Hudson River that departs from Grand Central Station every hour or so. It's our favorite way of getting to New York City from Upstate New York. Those who fly into JFK or LaGuardia can completely avoid city traffic by taking a bus or subway to Manhattan and Grand Central Station. Amtrak trains depart from Penn Station. The trip doesn't have the most scenic beginning -- except for those who fly into Newark -- but there are far fewer stops than a Metro-North train. And you may ride with Joe Biden! Poughkeepsie is an easy drive from most anywhere on the East Coast. All roads lead to Rome, but two major ones lead to Poughkeepsie: the Thruway and the Taconic State Parkway. The Thruway is I-87 and runs from Albany through New Jersey and beyond. The Taconic runs from the Bronx to East Albany and is incredibly scenic, even in November. If you can, we recommend you drive the Taconic. Here is a map to aid your travel. We've reserved a block of rooms at the Holiday Inn Express in Poughkeepsie under the code "FON" (an abbreviation for "Fun Over Night", "Fondaks OH NO! ", or "Fear Otters Now"). There are a variety of rooms -- King, King with a pull-out sofa, two Full beds -- available at $99/night and the block will remain active until the weekend before the wedding. Amenities include free wi-fi, complimentary breakfast (it'll tell you how good you look as you drink your OJ), an exercise room, and an outdoor pool, which will be hugely popular in late November. 1. The Vassar College Chapel (198 Raymond Ave., Poughkeepsie, NY, 12604): Ceremony location. 2. Alumnae House (161 College Ave., Poughkeepsie, NY, 12604): Reception location, plenty of parking. 3. South Lot: ceremony parking. 4. Main Gate Parking Spots: limited ceremony parking for persons with accessibility needs. Here's an interactive map of the College. Take a tour of the campus with the Vassar alumni attending the wedding! Noah Smith, Ashley Alter, and others will start the tour in front of Main Building at 11:00am. It'll be the most entertaining, enjoyable, personalized college campus tour you've ever taken! Elizabeth Daniels, the first Vassar College Historian, whom Ted helped on several occasions, built the Vassar College Online Encyclopedia. It's a fabulous, easy-to-peruse resource for learning more about the remarkable institution that somehow let Ted stay there for a while. Explore Main Building, which is Vassar's student center. Enjoy a snack at the Retreat, a haven for students who want a quick bite to eat or a guaranteed perch for spotting passing friends. 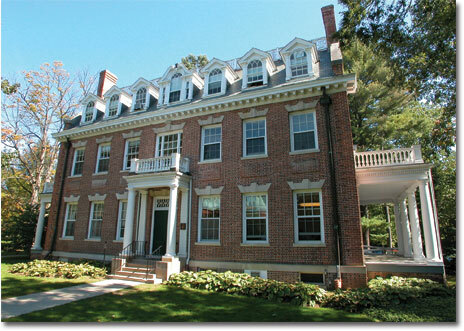 Visit the Frances Lehman Loeb Art Center, Vassar's world-famous art gallery near the Chapel. Stop by Swift Hall, the home of Vassar's History Department, Ted's baccalaureate creche, and Sanders Physics, where Ted studied, well, Physics. Pat the feet of the statue of Benjamin Franklin for good luck! Consider giving the undoubtedly stressed students coffee and donuts. Should the computer or smartphone you brought with you develop problems, take it to Vassar's CIS -- Computing and Information Services -- in the Old Laundry Building. Ted spent five formative academic years and many summers at the Help Desk, which you can see through a window as you walk by! Walk amongst a million volumes, tapestries, lovely communal study tables, gothic architecture, and singular stained glass windows in the Main Library, one of Ted's favorite buildings on this planet. Be sure to complete a pilgrimage to the stunning Cornaro window, which depicts the conferral of the first Doctorate to a woman -- Lady (Dr.) Elena Lucretia Cornaro-Piscopia -- and Vassar's true colors. Created from the bones of an old railroad bridge, the Walkway is the longest pedestrian bridge in North America. There are picnic areas at either end and benches at each of the three scenic overlooks. A can't-miss sight, even if you only have a few minutes to experience it. You're guaranteed to fall in love with the Hudson Valley, truly one of the world's great wonders. The iconic Poughkeepsie bridge. Ted falls back in love with this structure every time he's lucky enough to cross it. Nearby Kaal Rock Park -- the address of which is above -- offers a stunning (now familiar) view. Ted once conducted a choir here. This is a great path for walking along the Hudson and admiring the Great Bridges of Poughkeepsie. Generations of Vassar students have departed and arrived from this beautiful building. It's worth visiting even if you're not taking the train, though we hope many of you do take the train! Open 24 hours a day and a favorite haunt of Vassar students. Ted and his friends spent more and stranger hours here than they normally admit. This weekend, however, they'll confess quickly and eagerly! In deference to tradition, we'll go here Saturday night. A gem of a farm-to-basket grocery store -- one of Ted's absolutely favorite Poughkeepsie institutions. A must-experience. Ted and Peter Walker used to frequent this pub, especially on St. Patrick's Day. The events would begin here at 6:00am with a breakfast consisting of two pints of Guinness. They would then walk to the nearby train station to take a Metro-North train stuffed with revelers, bagpipers, officers of the peace, and more to Grand Central Station and the Fifth Avenue St. Patrick's Day Parade. Another famous Vassar student institution. Soul Dog serves incomparably delicious Carnivorous and Vegetarian hot dogs. Ted has heard wonderful things about this French brasserie in downtown Poughkeepsie, which is convenient both to Alumnae House and the Holiday Inn Express. You'll have to eat there Friday night and tell him all about it Saturday! Exceedingly convenient to Alumnae House (it's a short walk down the street,) the Beech was haute cuisine for Ted in college and it remains fabulous and reliable. Gastropub par excellence, the Beech's menu is a comfortable continuum from burgers to buttery-soft brie appetizers to Crème brûlée and lots of great cuisine in between. A fabulous lunch and dinner spot. Don't blink: this blue collar, Chinese-run Mexican Restaurant is located in the same building as the Beech. That it's tough to recommend one over the other is a testament to the delectable quesadillas, enchiladas, tortas, and other remarkable fare served here. Marvel at the sight of an automatic tortilla press that spits fresh product right onto a battle-tested griddle and next to piles of delectable caramelized onions and peppers. Fresco satisfies, day and night. Highly recommended. Also exceedingly convenient to Alumnae House, Chan's is, in Ted's opinion, the very best Chinese restaurant in the country. (Erin remains unconvinced.) Ted once rode ten hours on his motorcycle to dine at Chan's. While at Vassar, Ted probably bankrolled a significant fraction of their operation. Sadly, desperately sadly, Chan's was destroyed in a fire a few months ago, but will soon rise again like the proverbial phoenix, perchance in time for the wedding. Though better options exist in Downtown Poughkeepsie, Coyote offers a perfectly tasty meal in a convenient location for those staying at Holiday Inn Express on Route 9. Ted and friends would visit this place for a change of pace and variety, often during expeditions to the Galleria Mall, Halftime, or the Indian grocer near IBM's plant. Though its famous Rose Garden will not be in bloom in November, the Roosevelt Mansion itself, to which Franklin and Eleanor frequently escaped, is a phenomenal experience and highly recommended for anyone with even a passing interest in the 20th century. Often, criminally overlooked, Eleanor Roosevelt's summer cottage/socialist worker enclave tells a remarkable, moving story of the First Lady of the World, whose resolute efforts included the creation of the UN's Universal Declaration of Human Rights. As you walk the pacific grounds, you'll feel leagues and decades removed from the bustle of Poughkeepsie and New York City. Upon entering her cottage, you'll walk in the footsteps of John F. Kennedy, Haile Selassie, Jawaharlal Nehru, and many other luminaries, all of whom visited Eleanor throughout her long tenure here. Ted and Erin took a tour here during Reunion! The National Park Service says it best: "[A] remarkably complete example of a gilded-age country place, illustrating the political, economic, social, cultural, and demographic changes that occurred as America industrialized in the years after the Civil War." Have you seen Upstairs/Downstairs? The Vanderbilt mansion, dear wedding attendees, is a stage on which the grand drama of antebellum opulence played. One of a mindblowingly huge number of Vanderbilt estates, the Hyde Park estate is not the largest nor the finest, which will surprise you if you go see it. The grounds provide spectacular views of the Hudson river. Ted and Ashley Alter used to walk the grounds, do homework, and eat lunch at the nearby Eveready Diner! Also consider watching this documentary about the Roosevelt family, which appeared recently on PBS. Ted and friends were forever traumatized by watching Indiana Jones 4 at this fun venue from Ted's 1998 Toyota Sienna minivan. It might not be open, but it's on the way. Ted's favorite chrome-festooned diner, chock full of mid-century glamor and delicious, less-than-healthy diner standards. A great option for any meal but particularly good for breakfast. A must-visit! The Culinary Institute of America, a world-renowned gastrocapital, is a constellation of three incredible, student-run restaurants: the Ristorante Caterina de' Medici (Italian,) the Bocuse (ultramodern French,) and the American Bounty (well, American.) Available reservations are about as rare as some of the steaks they serve, but you may get lucky! Peter Walker used to work at Mohonk Mountain House, one of the premiere Hudson Valley resorts. A grand, striking castle situated atop Mohonk mountain, the resort offers carriage rides, miles of trails to hike, and luxurious spa amenities. Barner Books and Inquiring Minds are two awesome independent bookstores in New Paltz. Charming; full of exoterica and esoterica; located in lovely downtown New Paltz. You can spend hours in them. New Paltz is famously REPLETE with antique stores. Take home a treat! Rhinebeck is another lovely Hudson Valley town with wonderful restaurants (check out Terrapin -- Ted and Erin ate there during Reunions -- and the Beekman Arms,) nice shops, and a great indie movie theater. Ted didn't come here often, but loved every visit! A charming Hudson Valley (NOT WILLIAMSBURG ON THE HUDSON!) town. Those driving near here would do well to stop by; stroll down its charming, quaint streets; and visit nearby DIA:Beacon, a world-famous outdoor/indoor art museum and sculpture park. Look for the VW Camper turned into a slot toaster. Ted and Ashley Alter visited this town from time to time! Our friend Franklin D. Roosevelt, who had long envisioned a scenic road through the eastern Hudson Valley, was instrumental in making it a reality as a way to provide access to existing and planned state parks in the region. Its winding, hilly route was designed by landscape architect Gilmore Clarke to offer scenic vistas of the Hudson Highlands, Catskills and Taconic regions. The bridges and now-closed service areas were designed to be aesthetically pleasing. It has been praised for the beauty of not only the surrounding landscape and views it offers, but the way the road itself integrates with and presents them. Ted made a point of driving this whenever he could and many a Vassar student will praise the Taconic's wending beauty. The home and sanctuary of Thomas Cole, the father of the Hudson River School of Painting. An incredible museum featuring lovely art that will help you bond with the area. The sumptuously decorated home of Frederick Church, another Hudson Valley School Painter, Olana is a castle in the Persian style and a hugely popular, attractive destination. Those interested in additional spectacular views of the Hudson Valley should pay a visit to West Point and the famous Storm King Highway, which winds its way through and on formidable cliffs. Ted and Eric Myers rode their motorcycles around here. Ted and his mom also came here to conduct historical research. We don't actually have a typical registry. Having recently combined two apartments into one house, we have everything we really need that might usually appear on a registry. We consider your best wishes and/or presence at our wedding a tremendous gift already. However, if you would like to give a gift, we do have a few suggestions. If you choose to give a gift in this way, please let us know about it via e-mail -- we have awesome thank-you cards and we're ready to deploy 'em! Our house is a bit of a fixer-upper (e.g. every square inch needed to be painted when we bought it.) Resources for its repair and outfitting are far too large or impractical to be mailed or brought to the wedding: paint, crown moulding, a clean basement, a stove, a bathroom sink, lights for our ceiling fans, shelving, a shrubbery... you get the idea! It would help us greatly to build a handyperson's account, which we can use to make our house a home. We'll think of your gift with every wall we paint, every shelf we mount, every fixture we replace, and every shrub we plant. We'll be surrounded by friends and family! It'll surprise nobody to read that we have a penchant for adventure. Travel enriches and restores us. We try to explore as often as we can! Your gift will help us hit the road, soar above the clouds, dive beneath the waves, and rack up some rail miles. We'll chronicle the adventures you help fuel on a website so you can join us! We hope to visit family and friends frequently (Massachusetts, New York, Denmark, Michigan, Maryland, California, Colorado, New Jersey, Pennsylvania, and Alaska among others), take a train to the Southwest, hike Hadrian's wall, take in plays on the West End, visit Germany, camp around Lake Michigan, see the Northern Lights, orbit the Earth, and take a trip to the Moon! Well, at least several of these!